Kevin Fisher, in The Young and the Restless spoilers. 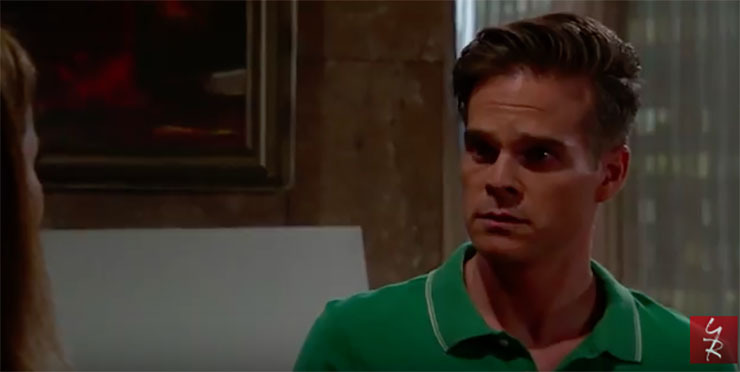 The Young and the Restless spoilers for Thursday, June 1st, predict that Kevin gets unwelcome news about his wife and the mother of his child, Chloe. Through sobs, Chelsea (Melissa Claire Egan) tells Kevin (Greg Rikaart) the bad news about Chloe. She’s dead. Kevin looks destroyed. If anyone knows what it feels like to lose a spouse, it’s Chelsea, who recently lost Adam herself. Related: Greg Rikaart addresses his shocking departure from Y&R. Also: Join the campaign to keep Greg Rikaart on the show! Kevin opens up to Gloria (Judith Chapman). Over a power lunch at the GCAC, Dina (Marla Adams) puts Neil (Kristof St. John) “in his place” for daring to school her on boardroom etiquette. She tells him to remember who he’s talking to. Don’t Miss: Jason Thompson had some exciting family news recently. Traci (Beth Maitland) tells Ashley (Eileen Davidson) that her dinner in honor of Dina may have a result she didn’t foresee. It may encourage Ashley’s mom to stick around Genoa City for good! Must-Know: Eileen Davidson on a possible return to Days of Our Lives. Take Action: Sign this petition to see more of Doug Davidson on the CBS sudser. Devon (Bryton James) and Hilary (Mishael Morgan) revisit their feelings for each other. Who knew they still have feelings for each other, right, dear Soap Cities readers? Before You Go: Gina Tognoni dished on succeeding in Hollywood! Previous ArticleGeneral Hospital Spoilers, Thursday, June 1st: Julian Gets Bad News About Ava! Y&R is so good right now, don’t you think?